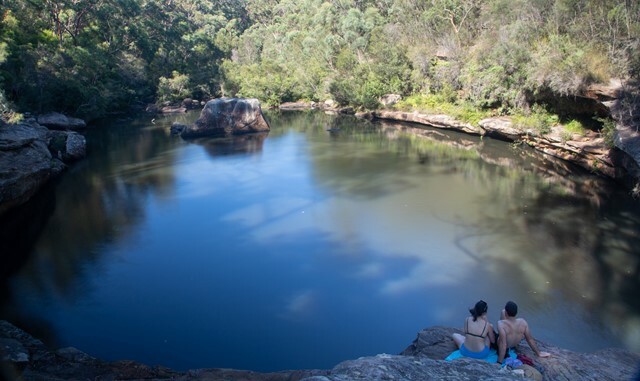 Dharawal National Park in the south-west of Sydney offers a few short walking tracks to idyllic swimming holes (Jingga Pool and Minerva Pool), and a longer cycling track. Both Jingga Pool and Minerva Pools feature on many Web sites on "best swimming holes around Sydney". From Helensburgh to the park’s eastern entry, turn left onto Old Princes Highway/​State Route 60. Turn right onto Darkes Forest Road and continue along to the park entry at Maddens Falls. From Campbelltown to the park’s northwestern entry, head south on Wedderburn Road, then turn right onto Minerva Road. Continue onto Lysaght Road, and turn left onto Victoria Road and continue to the park entry. 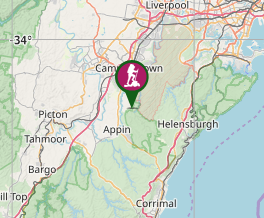 From Bulli Tops to the park’s southern entry, head north on Appin Road/​State Route 69 and continue towards Fire Road. You can access the park from the locked gate for the 10B management trail. The well signposted tracks descend from the main O’hares Creek Lookout Walking Track to Jingga Pool (2.8km return from carpark) and Minerva Popol (2.4km return).